Get ready for World War III! Carmel’s revaluation that dramatically increased property values along lakefront parcels by as much as $30,000 will be placed on the town’s tax roll on May 1. Carmel Town Assessor Glenn Droese made that annou… Please login below or purchase a subscription to the Putnam County Courier to access this content. When it comes to raising live chickens on one’s property, people are passionate on both sides of the fence. Residents of the greater Carmel-Mahopac area will soon be permitted to raise chickens as long as their property averages an acre in siz… Please login below or purchase a subscription to the Putnam County Courier to access this content. Hundreds of residents will be up early Sunday to participate in walk-a-thons. Putnam’s Heart Walk takes place at Brewster High School while the county’s annual MS Walk will take place at the Mahopac FD. The American Heart Association rep… Please login below or purchase a subscription to the Putnam County Courier to access this content. 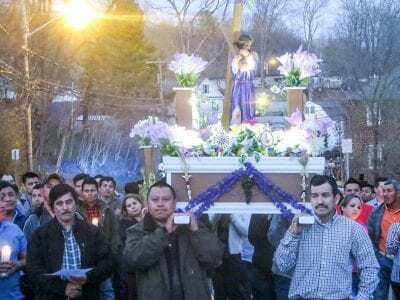 Good Friday was observed at churches throughout Putnam County on the day that commemorates the crucifixion of Jesus Christ, followed by glorious Easter services on Sunday. In Brewster, hundreds of Putnam’s residents originally from Guate… Please login below or purchase a subscription to the Putnam County Courier to access this content. 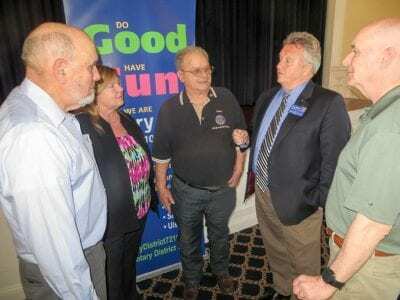 Top: Rotary District Governor Louis Turpin chats with Putnam Rotarians Kevin Carroll, Amy Covais, Greg Amato and Lou Margolus at last week’s countywide Rotary get-together in Mahopac. Above: Three generations came together at the countywide mee… Please login below or purchase a subscription to the Putnam County Courier to access this content. The Reverie Caffe in Patterson will be the home of April’s Music Hall Showcase, presented by Jacque’s Giant Hudson Valley Music Show of WPWL 103.7, on Friday from 8-10pm. The Music Showcases are held on the third Friday of each month, h… Please login below or purchase a subscription to the Putnam County Courier to access this content. Erin Meagher, a highly recognized fixture in Putnam’s business community who was arrested last month for allegedly using Chamber of Commerce money like a “personal slush fund,” appeared in Carmel Town Court last week and had her ca… Please login below or purchase a subscription to the Putnam County Courier to access this content. “Indy the wallaby,” who has been on the lam for the past three years, has been spotted in Brewster. 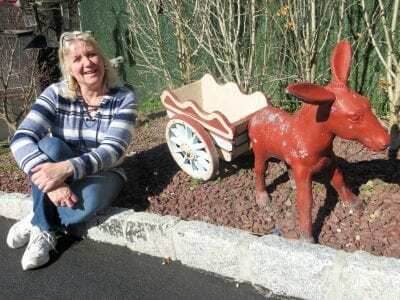 The kangaroo-type mammal, owned by Susan Saks of North Salem, took off on his jaunt in the summer of 2014 and after being periodically o… Please login below or purchase a subscription to the Putnam County Courier to access this content. With the recent hullabaloo about taxes, the facts are clear. Even without the “reval” going on in Carmel, Putnam County’s taxes are just HIGH. The New York City suburbs pay the highest taxes in the nation. Upstate, residents pay th… Please login below or purchase a subscription to the Putnam County Courier to access this content.